You'll feel welcome and care of at the deluxe suite. All photos courtesy of Hotel De'Ricci. 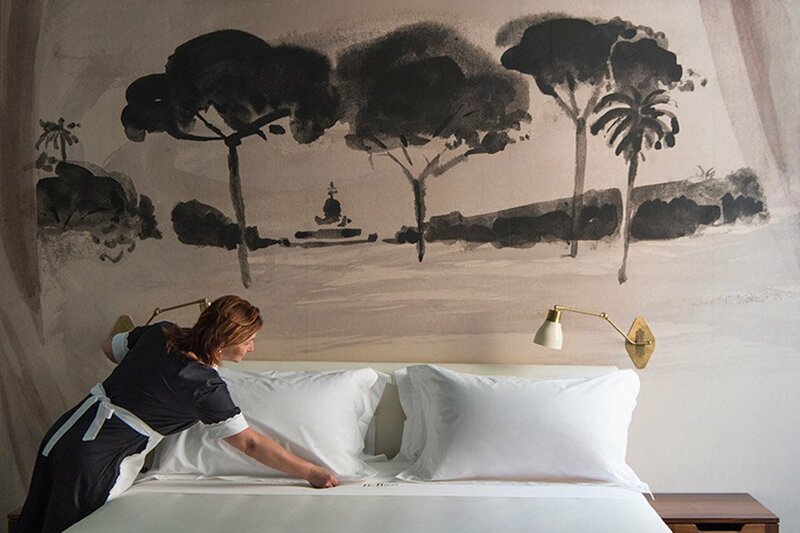 To Rome's excellent collection of charming boutique hotels, we add another from a beloved restaurateur. At Hotel De'Ricci, the focus is on wine as much as style. 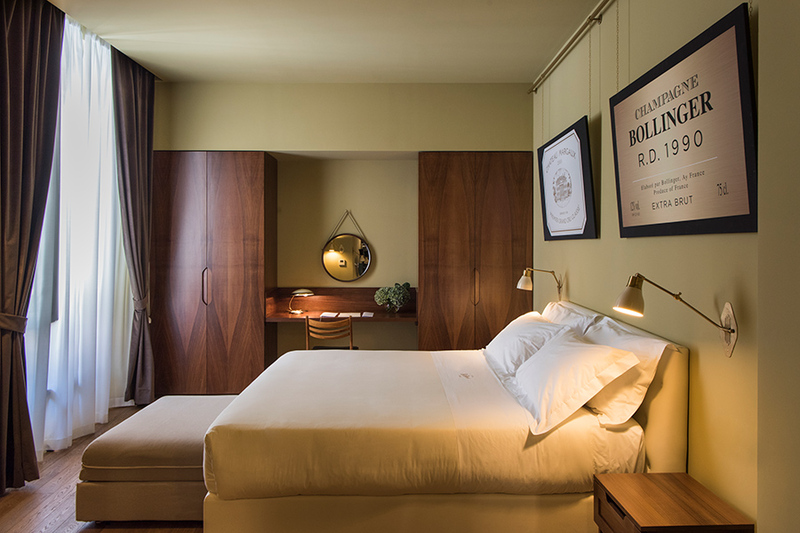 ROME – Velvet, wood, metal, and stone: These are the elements that adorn Hotel De'Ricci, the hidden and highly designed brainchild of beloved local restaurateur Lorenzo Lisi, which just opened in the heart of Rome. Though you'll be forgiven for overlooking the design if you're easily distracted by grapes. 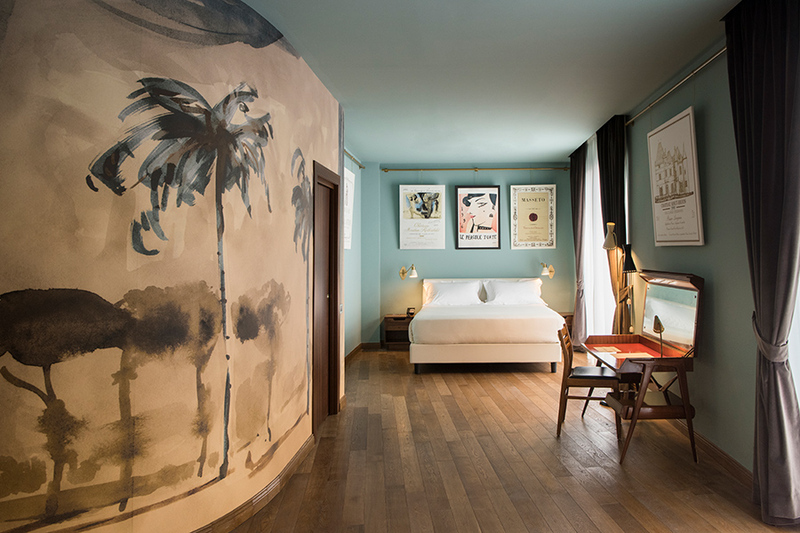 With only eight rooms, Hotel De'Ricci is an elegant boîte parading as a sophisticated boutique hotel. Design devotees will devour the meticulous details of the space, from the original vintage furniture to the hand-painted frescos by Andrea Ferolla. Inside each rich and spacious suite are a contemporary king-sized bed, luxurious linens, and an elegant black-tiled bathroom with toiletries by Parisian perfumer Francis Kurkdjian. Every room called to me in its own way, but given the choice I'd take the super deluxe suite, which has a separate lounge that spills onto a large terrace overlooking the private interior courtyard. This is where you'll find me early morning, on a plush sofa amidst the figs and rosemary with my espresso. After design, the focus of Hotel De'Ricci is on wine. In a seriously committed way. The staff is expertly trained as sommeliers. 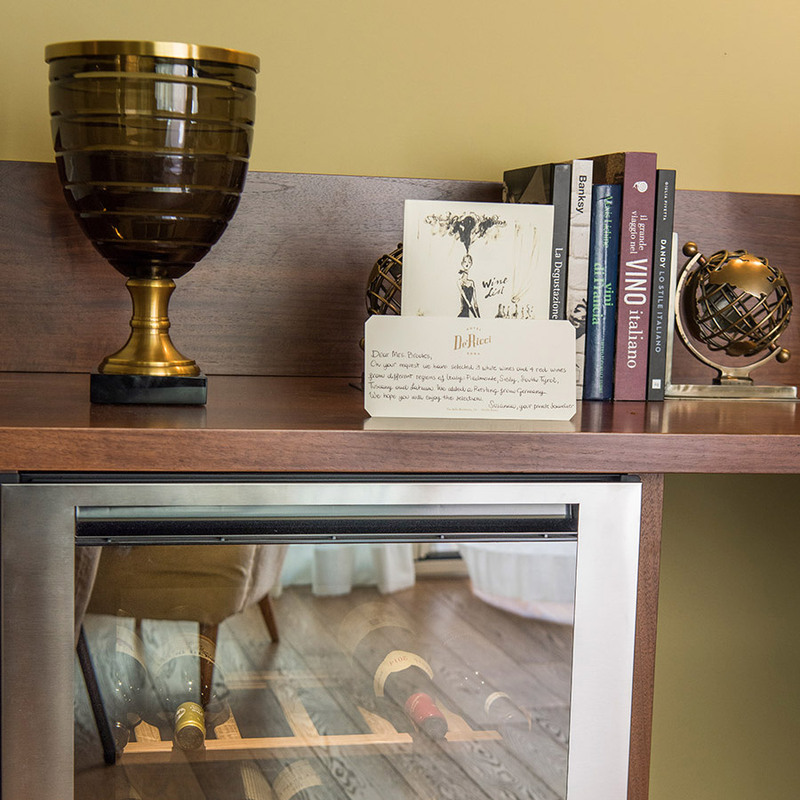 Additionally, every suite has its own wine storage units, which are curated according to guest preferences at booking, and a Coravin, the wine-opening device (and technology) that allows for extracting a glass at a time without ruining the rest of the bottle. The guest's custom wine experiences will include — in addition to selections from the 1500+ labels in the subterranean cellar — wine tasting tours in secret cellars and vineyards around Rome and throughout Italy that are not typically open to visitors. But the experience doesn't stop at wine. 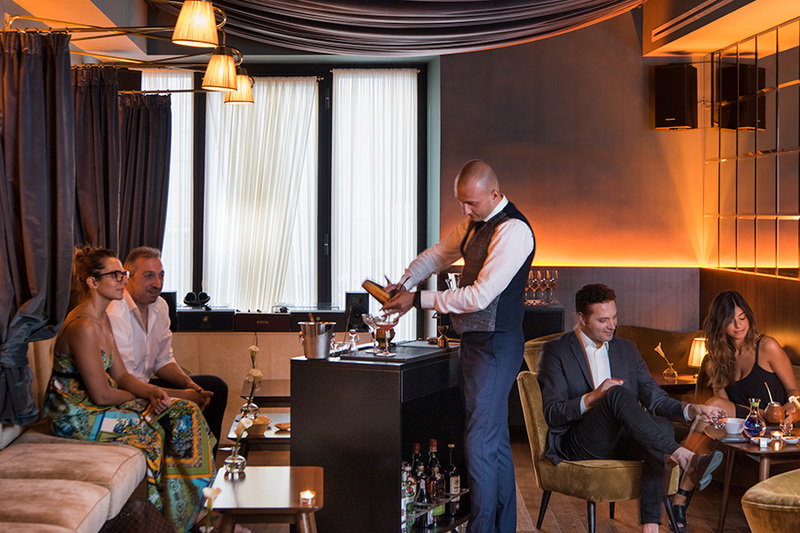 On the first floor, the swanky speakeasy lounge and Charade Bar evoke a classic gentleman's club, serving cocktails with a profusion of top-shelf whiskey made by talented mixologist Stephano Ripiccini. In keeping with the theme, Hotel De'Ricci provides a cleverly-designed smoking lounge adjacent to the bar, where one can enjoy a cigar or cigarette behind a sleek double glass door. (This is Italy, after all. They still smoke.) After a day of wandering and exploring Rome, this moody lounge is my favorite spot to stop, sink into a velour club chair, and sip a single malt. Lorenzo Lisi, owner of hotel De'Ricci, also happens to be the affable manager of Pierluigi restaurant in nearby Piazza de Ricci, one of my Roman favorites. So it goes without saying that this little hotel knows food. The menu at Charade Bar is chef-driven, delicious, and also available in-suite. I'd choose a platter of San Daniele cured ham and fresh burratina with semi-dried tomatoes, or maybe smoked wild salmon with blinis and sour cream. The pan brioche with foie gras and bitter orange marmalade would pair fabulously with many of the hotel's special edition wines. 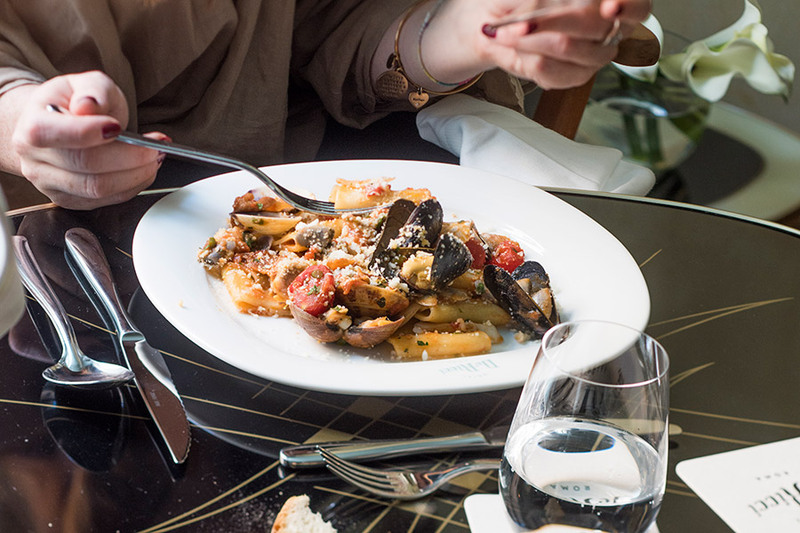 For more selective eaters, the hotel offers vegetarian dishes with an Italian twist, as well as hotel standbys like Caesar salad, club sandwiches, and cheeseburgers. 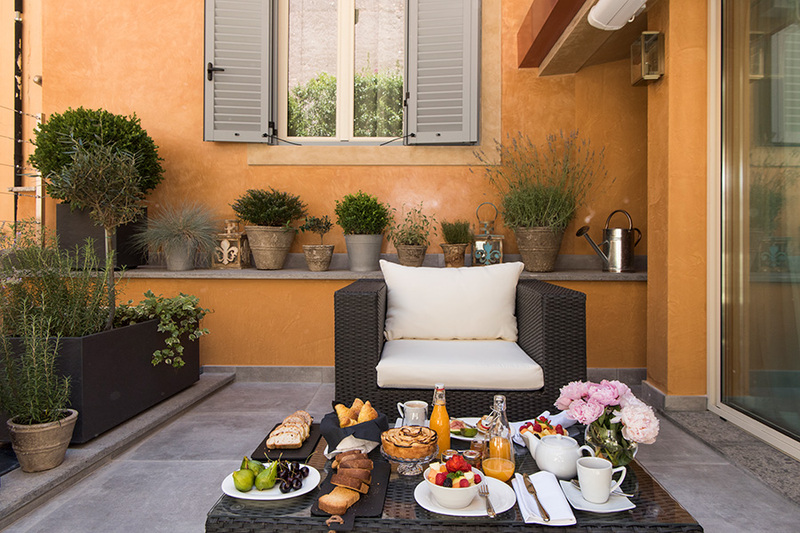 Hotel De'Ricci is nestled off the beaten path yet incredibly central, located between Via Giulia and Corso Vittorio Emanuele in the charming Rione Regola district. It's steps away from many of the greatest hits in the historic center: Vatican City, Piazza Navona, Campo de' Fiori, and the Pantheon. 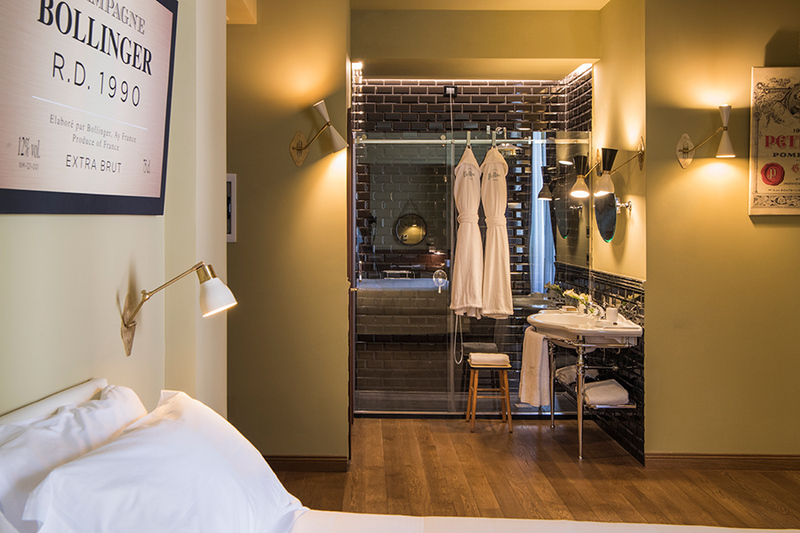 The hotel is perfect for travelers seeking understated luxury and fine wines, who want to discove and explore the quiet cobblestone alleys so emblematic of Rome. Rates from €350. Click here to book. Hope is a chef, author, world traveler, media personality, and producer and host of "CravePhilly", a two-minute video series highlighting Philadelphia’s food scene. You can follow her on Instagram and Twitter at @hopecooks and @icravephilly. She travels for the sea and in search of her next meal, but not always in that order.